Hello, friends! I hope you enjoyed your Thanksgiving break. It’s finally time to switch gears into Christmas mode! The super sweet Carrie from Lovely Etc. invited me to participate in the Very Merry Christmas Home Tour. 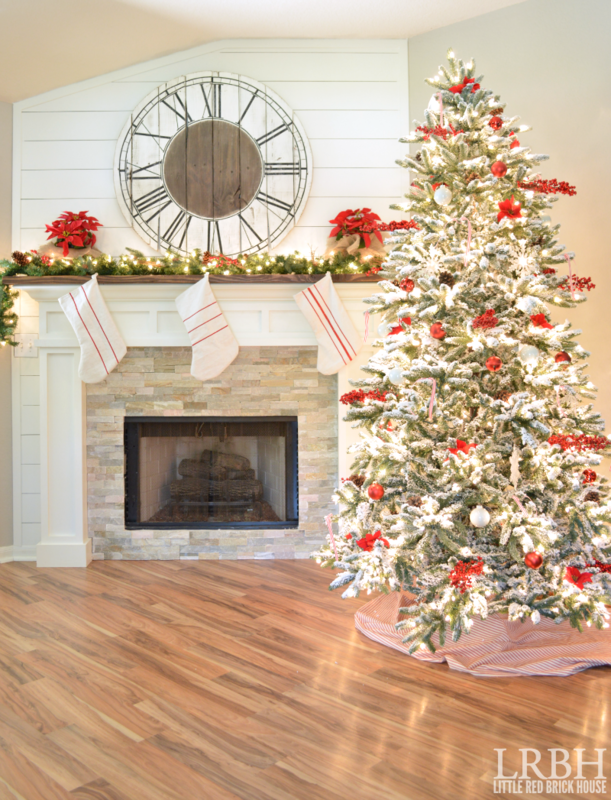 I’ve been ready to decorate for Christmas since the day after Halloween, so I’m really excited about sharing some of my Christmas decor with you. Also, in the spirit of Christmas giving, the other blog hop participants an I are holding a $500 PayPal cash giveaway!! Be sure to read all about it at the end of the tour. 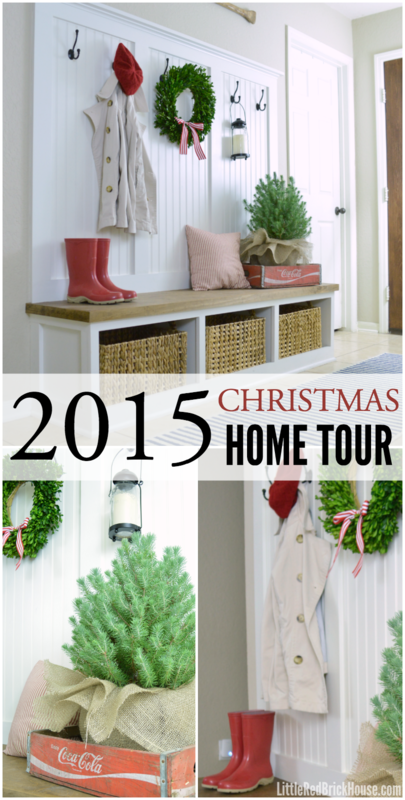 Now, let’s get to the 2015 Christmas Home Tour goodness! This was my first year decorating the mudroom for Christmas and boy did I have fun! I’m feeling really traditional this year so I went with a red and white color scheme. This post contains affiliate links for your convenience. Click here to read my full disclosure policy. 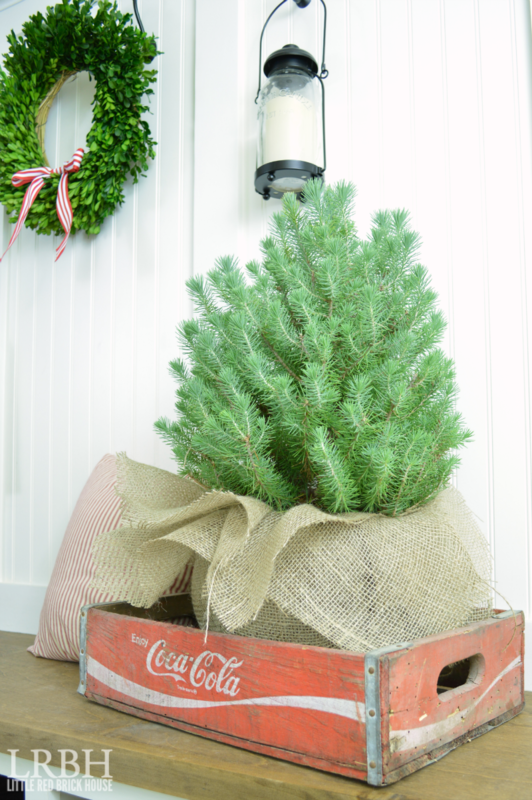 I added a real mini Christmas tree, wrapped in burlap, and placed it in an old Coca-Cola crate. I tied a red and white striped ribbon in a bow and pinned it to my boxwood wreath. I love the contrast of the red against the rich green. I hung a lantern that houses a battery powered candle from one of the hooks. Can’t leave the house without a warm jacket, fuzzy hat and boots (similar). I whipped up this little pillow with some red ticking stripe fabric I bought from JoAnn’s. I decided to go with a flocked tree this year and I don’t know why I didn’t try it before. It’s gorgeous! My husband did an amazing job flocking it. We followed this tutorial from Lovely Etc. 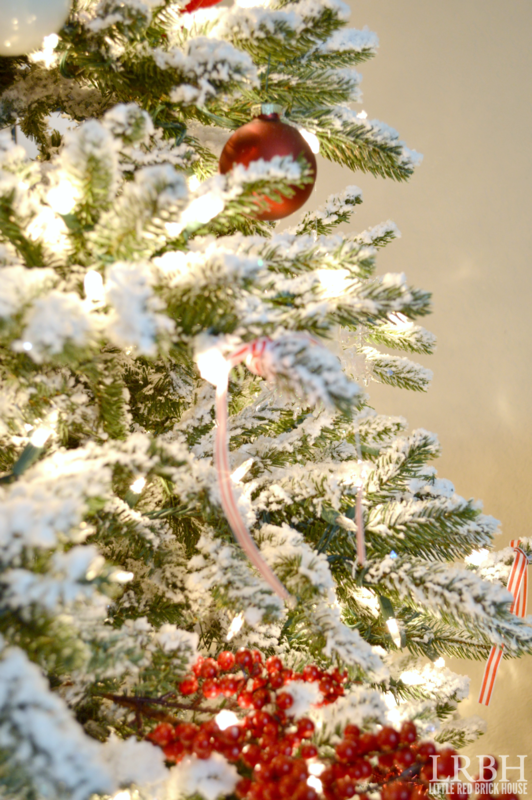 The tree is trimmed with sprigs of red berries mixed with red and white bulbs, striped ribbons, red poinsettias, a few pinecones and giant snowflakes for good measure. I draped my excess ticking fabric around the base of the tree as a skirt. The kept the mantel simple with lighted garland and two potted poinsettias that I wrapped in burlap. The stockings were made from drop cloths. You can find the tutorial here. Here is the tree and mantel all lit up at night. I love that glow and wish I could keep it up all year round. 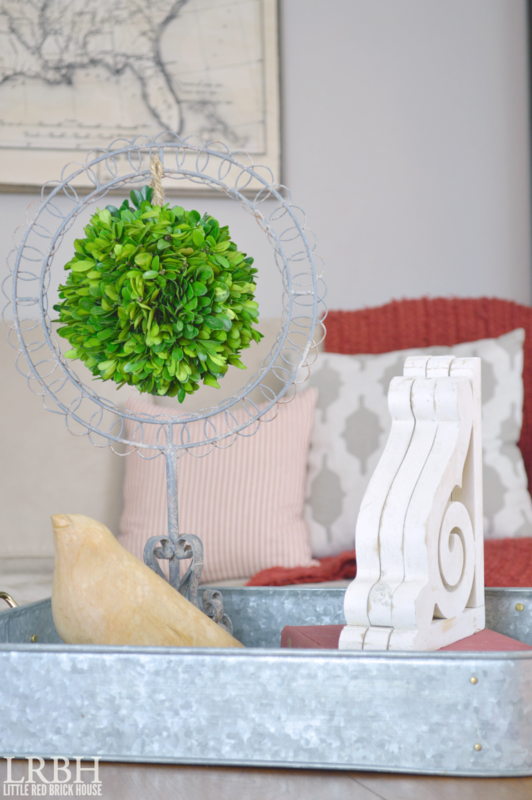 The coffee table vignette got a little makeover too. I tied a boxwood round to this vintage photo display and added a wooden bird and my salvaged corbels stacked on top a vintage book. 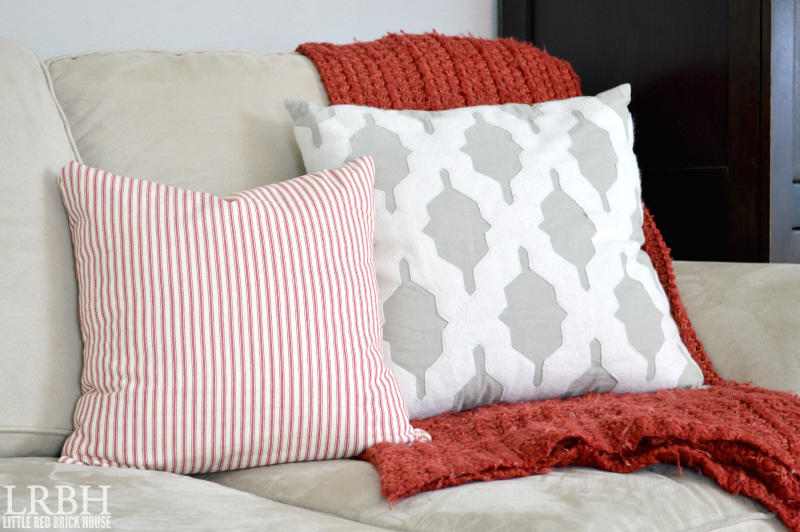 More red ticking stripe pillows and a red throw round out the living room decor. Thanks for stopping by to check out the tour! 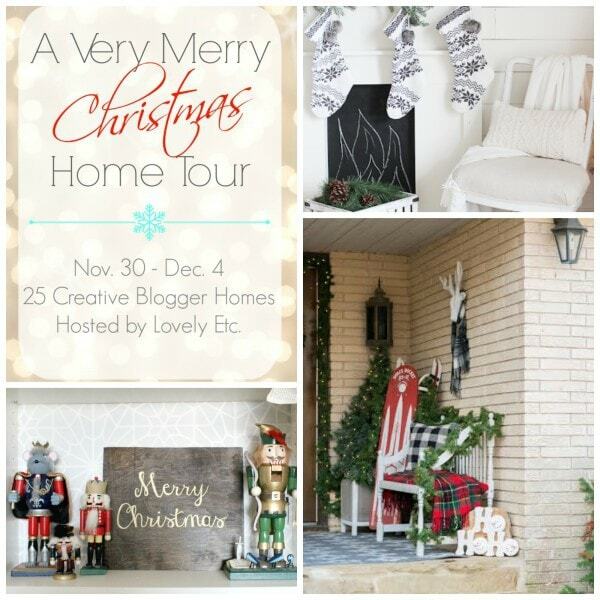 For even more Christmas goodness check out Part Two of my Christmas Home Tour here. 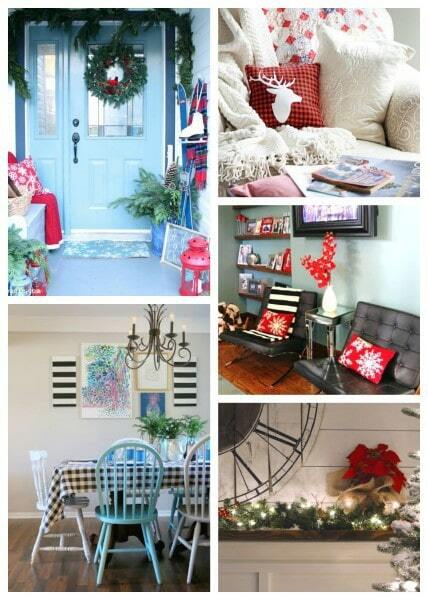 Such a beautiful home and lovely Christmas decor. 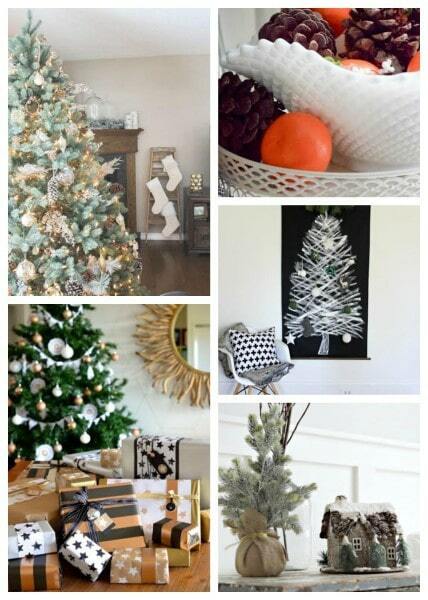 This just got pinned to my holiday inspiration board. Thank you so much, Erica! I can’t wait to see your tour! 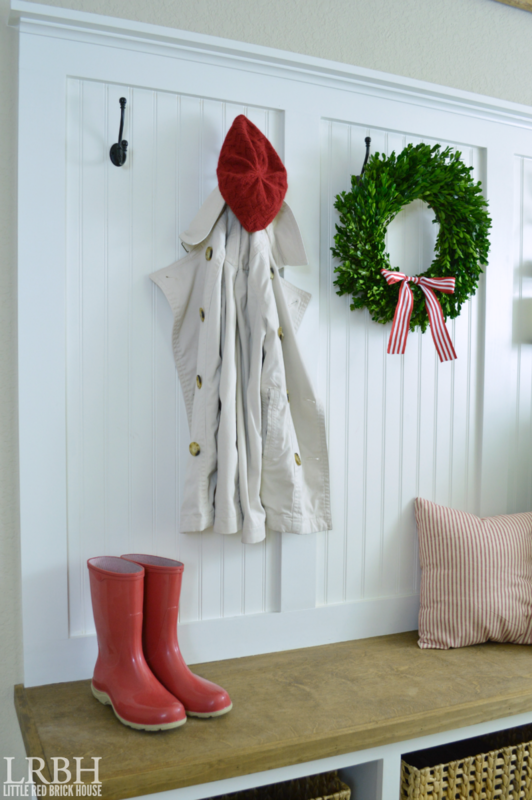 The flocked tree looks so gorgeous, and I am dying over how good the mudroom looks! Love it! Thank you, Angela! It’s so fun to decorate it for each season! Thank you, Bre! I’m obsessed with the tree! 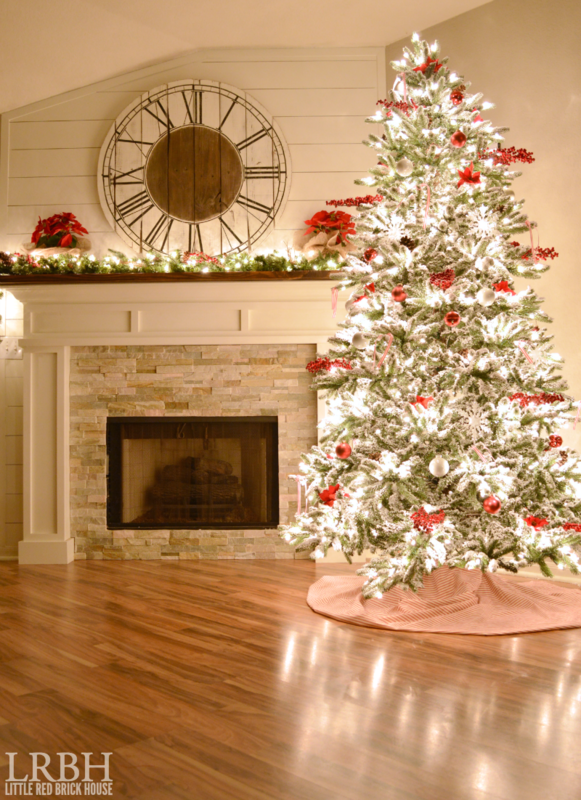 Your tree is gorgeous – love it! And I love the beautiful, classic decor in your entry. Thanks so much for sharing and joining the tour! Thank you so much, Carrie! It was a ton of fun to decorate and really got me in the Christmas spirit. Thanks for inviting me to participate! Oh my goodness Sarah!!! It’s absolutely gorgeous!!! 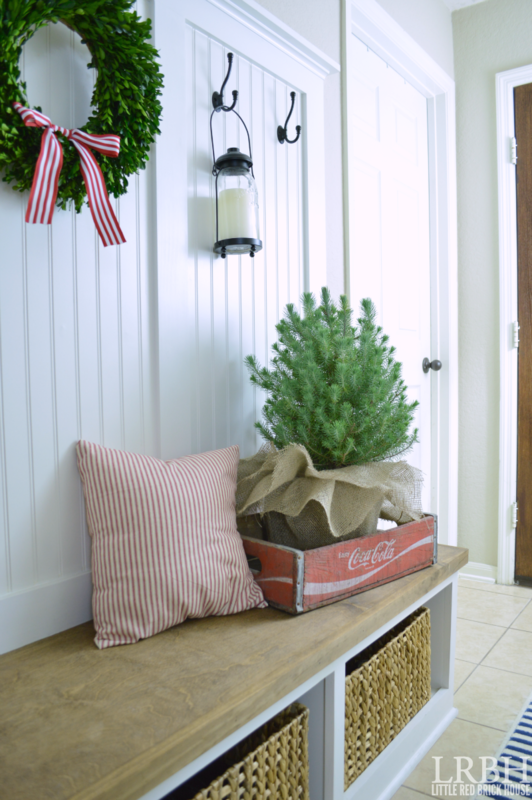 Your entryway looks so inviting and that tree … AHHHHMAZING! Love it all my friend! Thank you, Kristi! I don’t want to ever take it down, it’s so cute! Your home is breath-taking! I love the red touches, so refreshing and classic. Oh it’s all just beautiful, Sarah! The flocked tree turned out amazing! Thank you, Bre! I’m so glad I decided to flock it this year. I love it! WOW!!! So many beautiful things! Love the tree and coke a coca crate! I wanted one so bad for our vintage tree. I couldn’t find one so I settled on a squirt crate, next store… coke crate!!!! 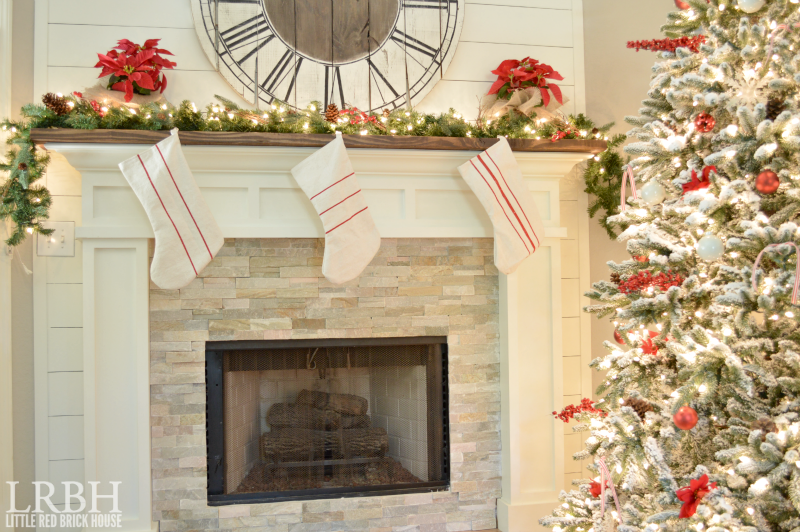 Your shiplap fireplace is heavenly. So jealous of your tree too!!!! Awesome job. Thank you so much, Sara! The Coke crate was a flea market find and I love it! Loving all the red and white with the greenery! And the flocked tree–I really need to do that next year–it’s beautiful! Thanks, Gretchen! I’m really loving the red and white, too. 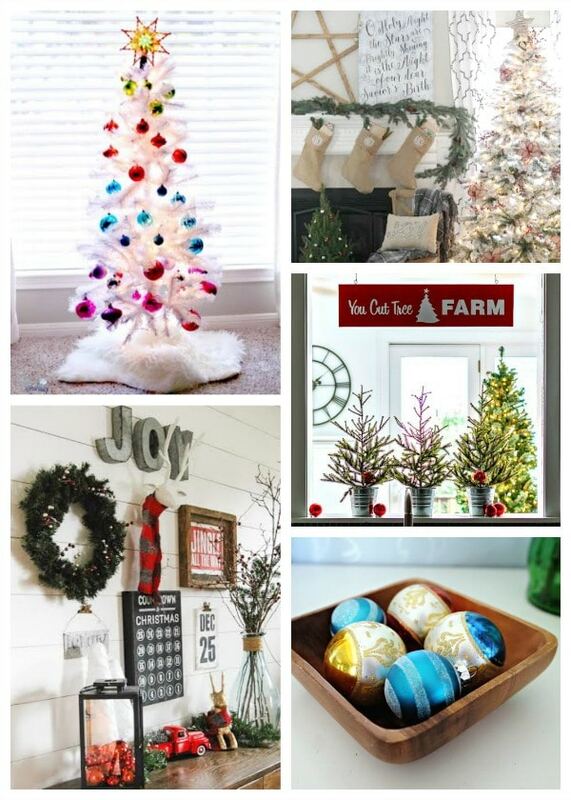 And you should totally try a flocked tree. It’s magical! Everything looks gorgeous, Sarah. I absolutely love your tree. I bet it was a lot of work but totally worth it! Thank you so much, Amy! It was totally worth it. I love it! Gorgeous Sarah! I just love your home and taste. Your tree is so gorgeous and that hallways bench is my fav! Thank you so much, Deb! You are so sweet! Oh Be Still my heart! I LOVE the red and white theme. I just wore out my pinning button. Thanks for the beautiful little tour!! Oh Krista, you are so kind! Thank you so much! I’m glad you enjoyed it. Love all the reds and fresh greenery you used in your decor! Thank you so much, Darrielle! Oh my, I need a flocked tree in my life asap! Also, can I just say that your entryway is the cutest thing ever. Thank you, Ashley! Aren’t they so gorgeous!? I’m so glad we decided to flock it this year! LOVING Sarah!! 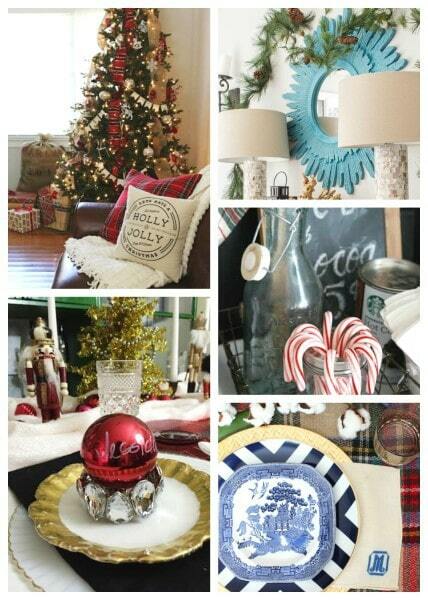 I adore your home and all the bits of Christmas decor are so cohesive. 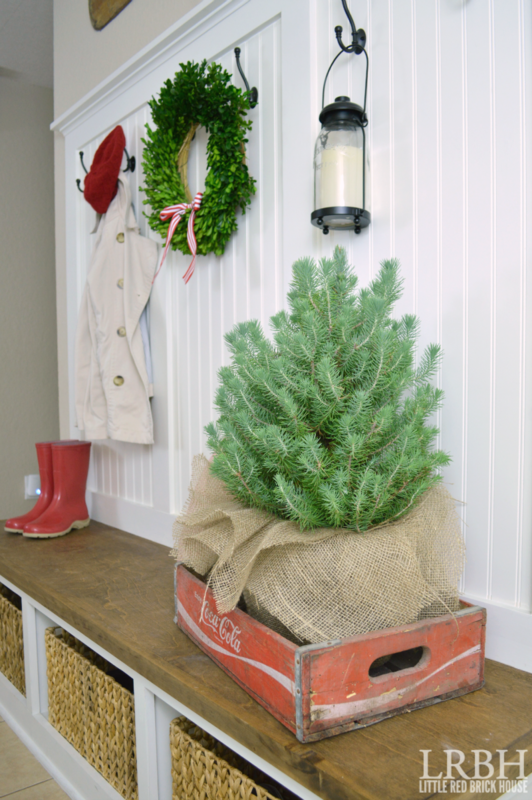 Loved your tree and entryway! Pinning and sharing! 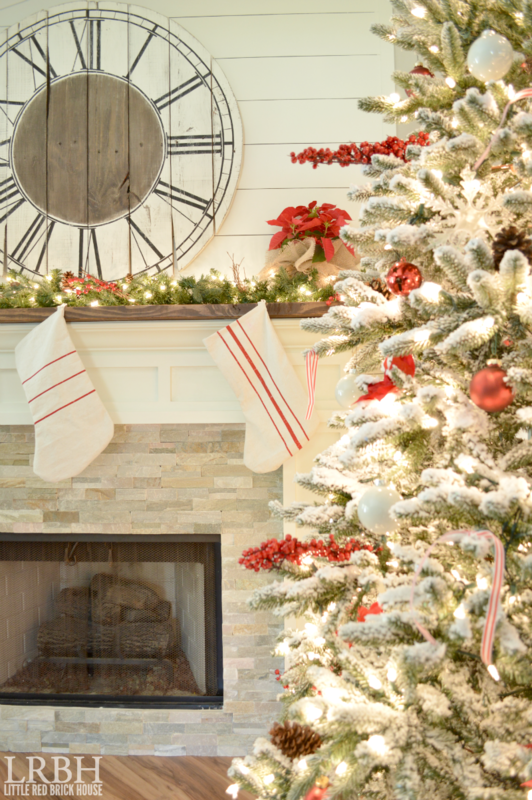 I love the red and white and the flocked tree….haven’t seen one done in years. I have a decor question. 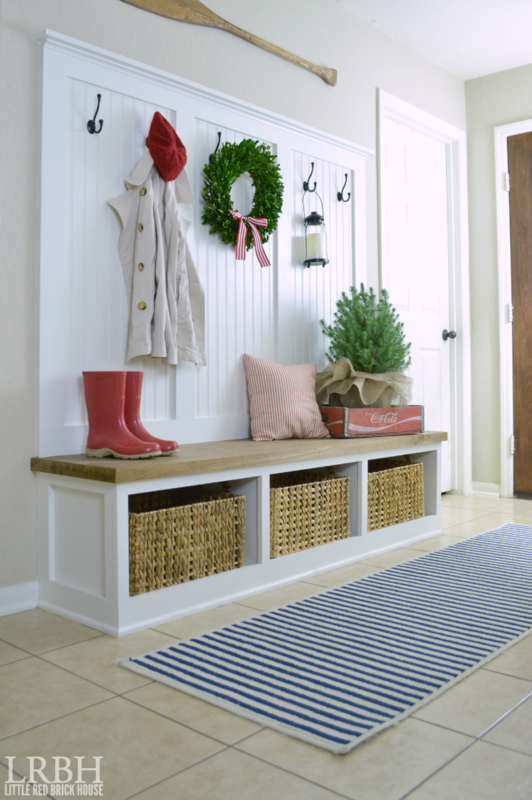 I am looking for baskets like the ones in your foyer. Could you give me the source, Please? I am cutting off the legs of a mid century out door lawn furniture set and building an indoor couch and chair with storage under it….That shouldn’t be that hard, right? LOL Now about those baskets??? ?